Have you had a picnic blanket, beach blanket or camping blanket before that didn’t serve you well for your outdoor adventures? - NOT Portable, NOT Large enough, NOT Waterproof, NOT Sandfree, NOT lightweight, NOT durable and …?! Water Resistant and Sandless: Unlike those made of standard parachute fabrics, 3Nature outdoor picnic blanket allows you to place the blanket on damp grass, at campsites, and on wet sand – all without worrying about getting yourself wet! Sand will shake right off, so it can be packed away between uses without making a mess. Great Quality AND Durablity: 3Nature picnic blankets are durable, made of triple stitched, high-grade 210T Nylon plus a high quality waterproof coating, providing years of use. The blanket is easy to care for. Care instructions are included, and the blanket is machine washable and quick drying. Extra Large, yet portable and Lightweight: This foldable picnic blanket unfolds to a size of 7’x9’ (210x270cm), 63 sq. ft – big enough for the whole family! When not in use, the blanket folds away into an incredibly small pouch - 7.7’’x6.5’’ (19.6cmx16.5cm), weighing 17oz (470g). Accessories: Other useful features include 4 button-up sand pockets, 1 zippered pocket to store your valuables, a small pocket for keeping ground stakes easily, and integrated pouch for easy storage when folded. The blanket has an anchor loop on each corner, and includes 4 BONUS stainless steel ground stakes to stop the blanket from blowing away in strong winds. 100% Satisfaction guarantee: We pride ourselves on the quality of our products. If for any reason you are not completely satisfied with your product, return the item within 30 days for a full refund. ✅ WATERPROOF, OVERSIZED BUT COMPACT: With other picnic blanket, felt awful when used it on damp ground, too small to fit the whole family, or too bulky and heavy to carry around. 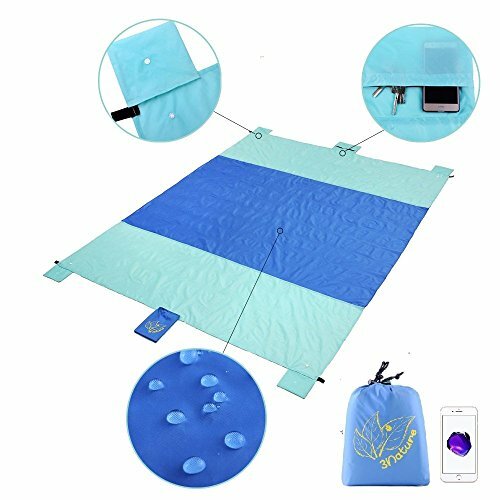 NOW you can enjoy to lie on your comfort 3Nature WATERPROOF blanket at the beach, on the wet grass, or anywhere you'd like to stay DRY. Your entire family can fit on this 3Nature OVERSIZED, 63 sq. ft outdoor mat, while you can easily carry it in a compact 7.7''x6.5'' pouch with only 17oz lightweight. ✅ PREMIUM, DURABLE AND INGENIOUS: 3Nature Picnic Blanket / Beach Blanket is made of triple stitched, high quality waterproof fabric (210T Nylon with PU coating). It's designed and manufactured with care as if for our own use. The mat can stay anchored with either the 4 corner sand pockets or 4 ground stakes with ease. Even you can store the ground stakes in the unique designed pocket without worrying losing them. ✅ SAND FREE and MULTI PURPOSE -Easily cleaned and dries quickly, Shake sand right off and pack in the bag. Your best outdoor companion, can be used as a blanket/mat! Great for beaches, picnics, parks, family trips, sports events, open-air festivals, camping, hiking, fishing, other occasions and outdoor activities. ✅ ACCESSORIES - 4 button-up sand pockets;1 zippered pocket for valuables, 1 pocket for stakes, and 1 integrated pouch for easy storage; 4 anchor loops, 4 BONUS stainless steel ground stakes for windy conditions. ✅ RISK FREE PURCHASE - 3Nature team pride ourselves on the quality of our products. If for any reason you are not completely satisfied with your product, return the item within 30 days for a full refund. If you have any questions about this product by 3Nature, contact us by completing and submitting the form below. If you are looking for a specif part number, please include it with your message.